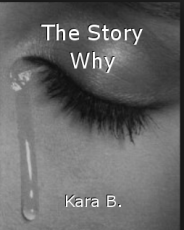 The Story Why, poem by Kara B. This is a poem I wrote a while ago to try and sort out my thoughts... and it actually turned out quite good. Any advice or criticism would be appreciated. I can figure it out. © Copyright 2019 Kara B.. All rights reserved. An effective way of displaying an excellent poem, Kara. Other Content by Kara B. This page was created in 0.4264 seconds.